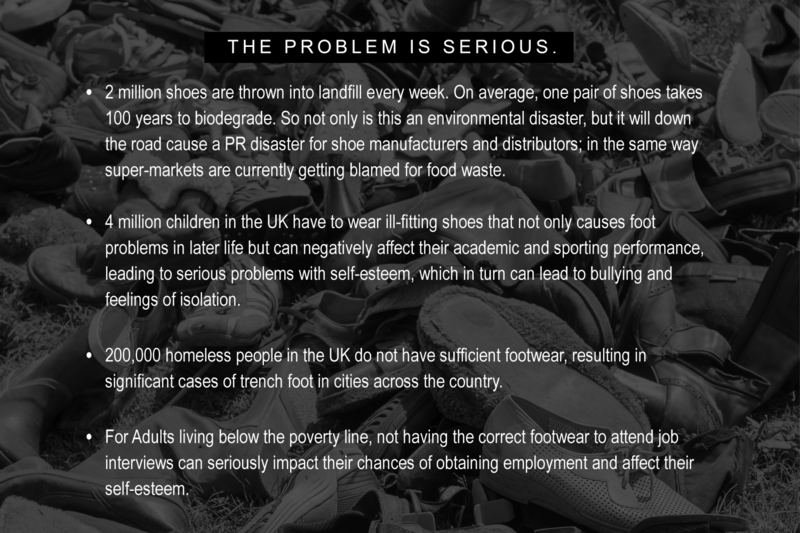 2 Million shoes are thrown into landfill every week. On average, one pair of shoes takes 100 years to biodegrade. So not only is this an environmental disaster, but it will down the road cause a PR disaster for shoe manufacturers and distributors; in the same way super-markets are currently getting blamed for food waste. 4 million children in the UK have to wear ill-fitting shoes that not only causes foot problems in later life but can negatively affect their academic and sporting performance, leading to serious problems with self-esteem, which in turn can lead to bullying and feelings of isolation. 200,000 homeless people in the UK do not have sufficient footwear, resulting in significant cases of trench foot in cities across the country. For Adults living below the poverty line, not having the correct footwear to attend job interviews can seriously impact their chances of obtaining employment and affect their self-esteem. 1.5 billion people worldwide without shoes of which 300 million are children. 70 million children are unable to access suitable education because shoes are required as part of the school uniform.